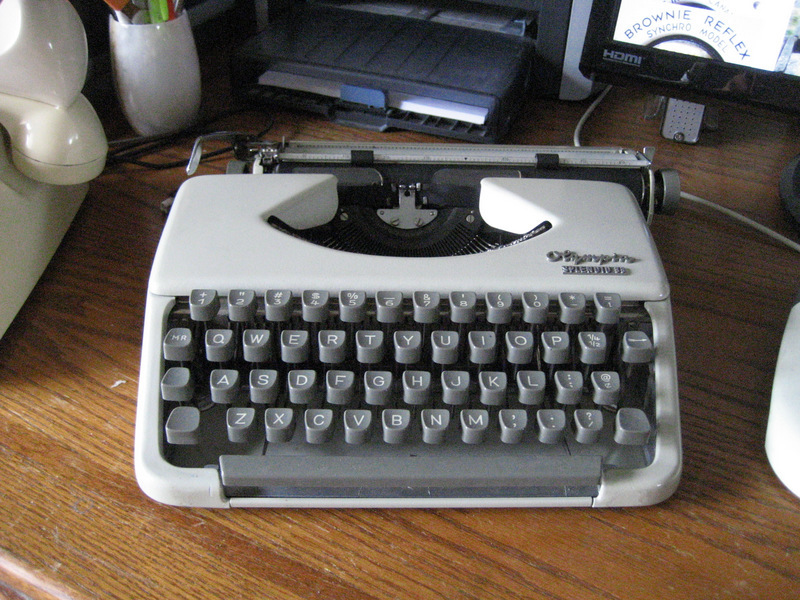 All typewriter hunters well recognize it; the little brown plastic case with a plastic handle. Inside is a JP-1 Brother, with or without some features like a tab key or a paper rest. This one was sitting on the floor in the back corner of the Salarmi. The cover even had the familiar Brother logo. I lifted the cover. 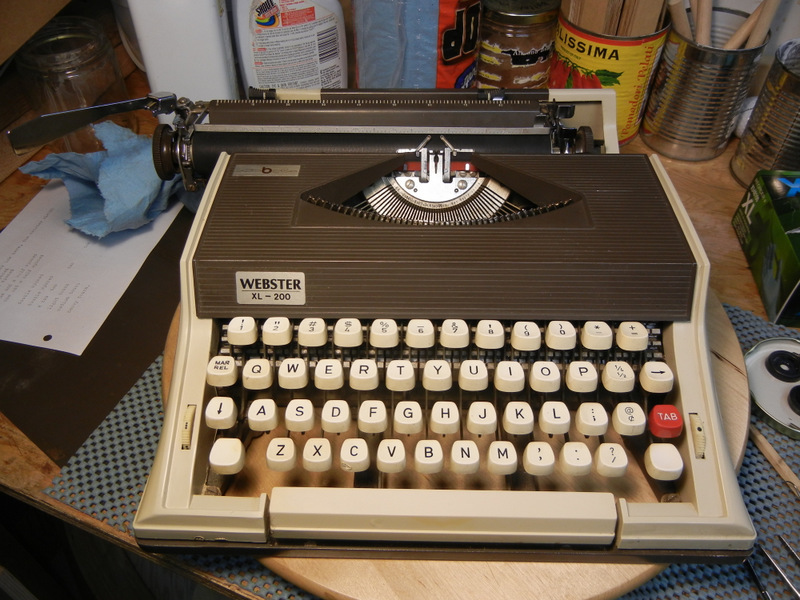 Webster XL-200. OK, that was a Brother brand, but wait a second – it has tilt-shift! Never saw a Brother with that feature. I bought it and took it home to have a better look. Clearly it was not a JP-1, or a JP anything. For one thing it wasn’t even Japanese. 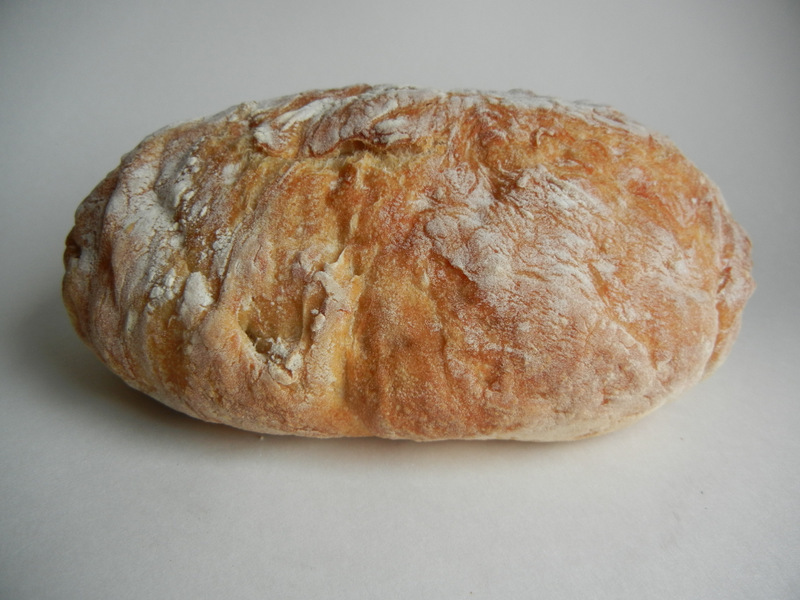 It was made in Portugal. That gave the game away of course, since I have a very similar machine already, a Sears Chevron. Sharing the same mechanics this one has a different casing and cover, however. It needed a lot of cleaning up and minor adjustments, so I removed the bottom cover. As much as I removed piles of dust and rubber shavings the escapement still hung up around the centre position. 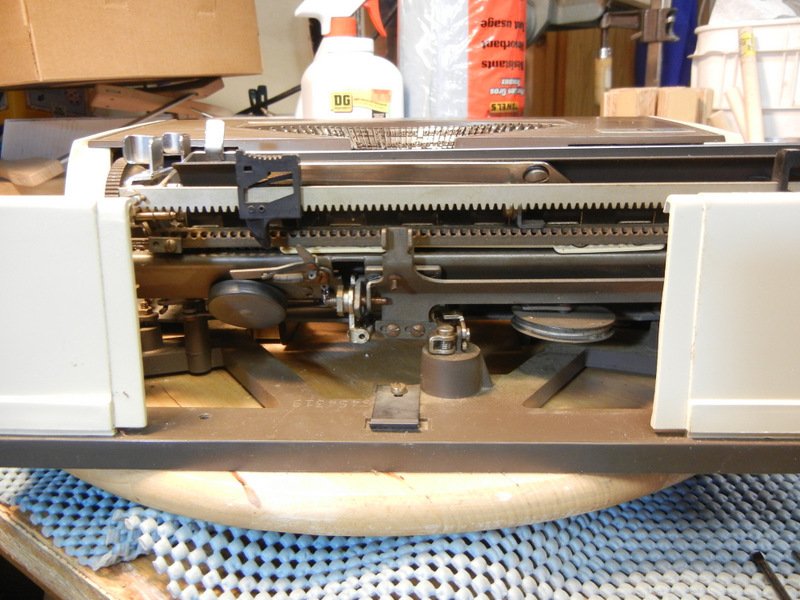 To access the escapement the platen had to be removed. Thus I discovered how well made this machine is, from the point of view of servicing. I removed the platen wheels with two set screws, then a third screw on a collar on the right side, pulled out the axle and simply lifted the platen out. Removing the pinch rollers and tray I could see one problem right away, more crud on the pair of dual tooth dogs that engage the linear gear bar. 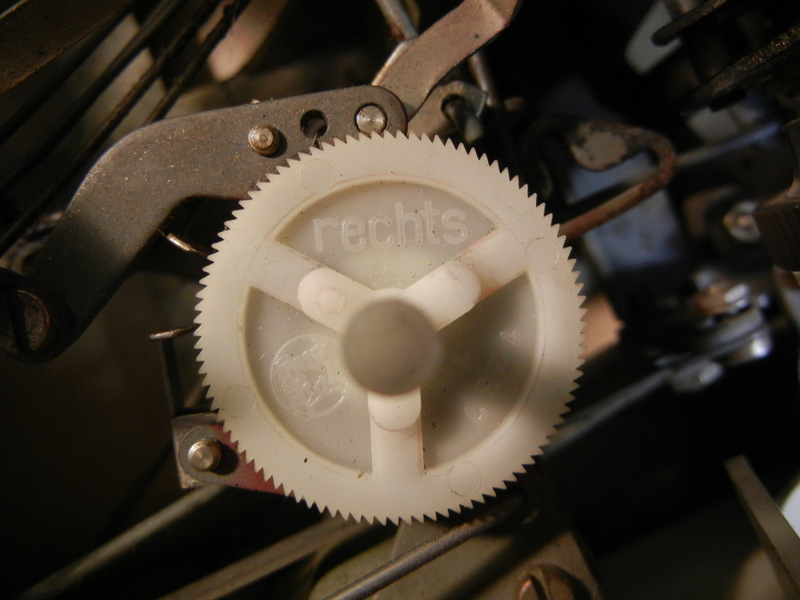 This pair has an adjustment screw, and there was the main problem – the lower dog was hanging up on the linear gear train. A simple twist of the adjusting screw and all was well again. 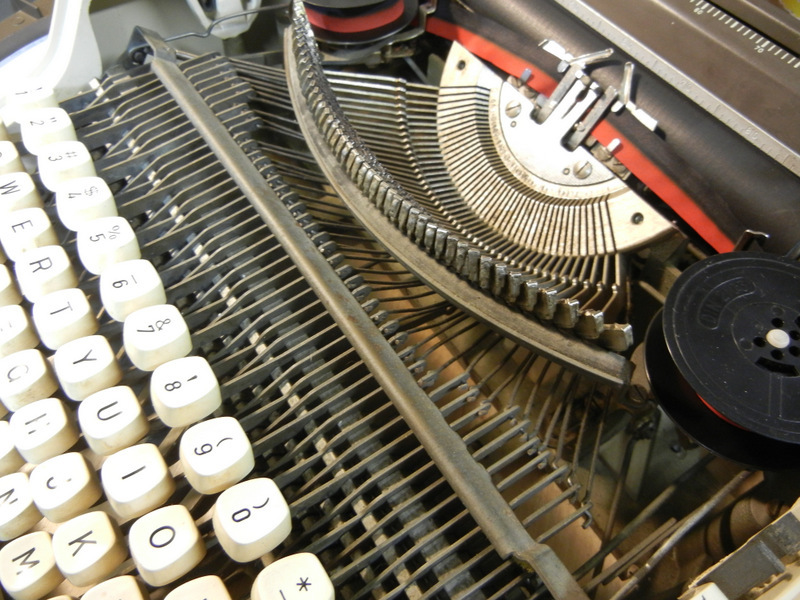 The tab key train also needed a slight tweaking by way of bending the end that pushes the carriage release mechanism. The rear panel of the case has a neat feature – the centre section snaps on and off providing access to some inner parts for quick adjustments. After working on this I have to admire it’s construction. The frame is a very solid and light aluminum casting. It has tilt shifting – far easier than carriage shifting. 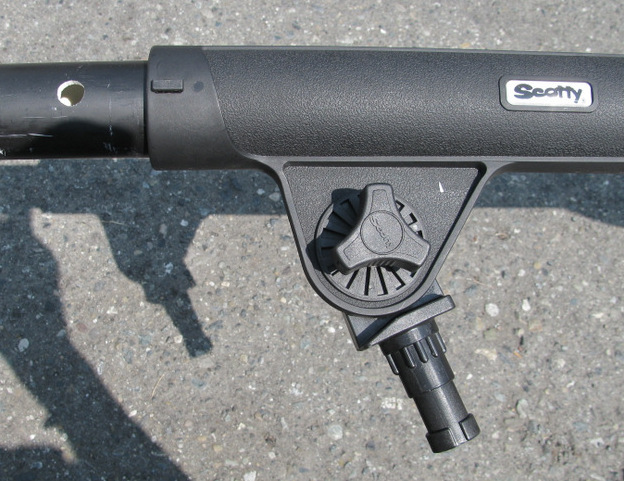 Access to mechanism is excellent, and all parts are solidly made and fitted. 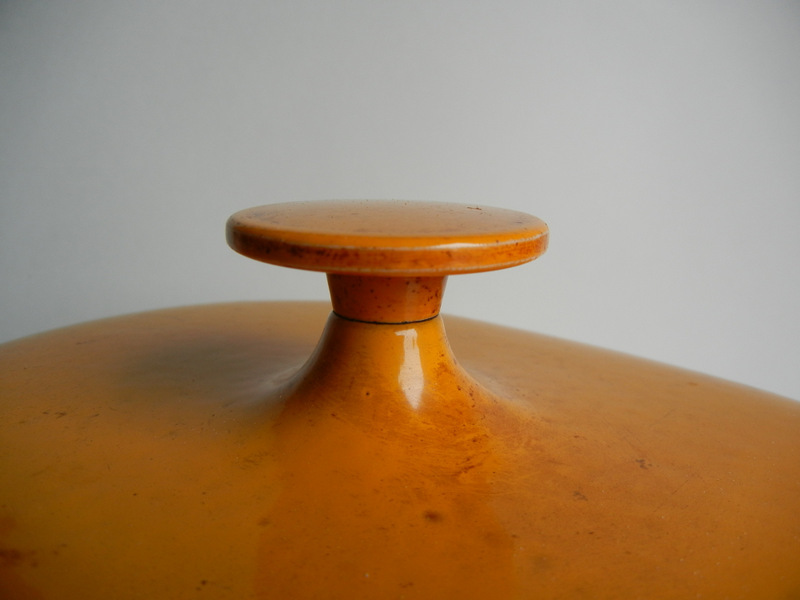 Even the rubber feet are soft and pliable like new. The platen is not as soft as a typical Japanese made Brother however, although by no means rock hard. Nevertheless I applied several coatings of silicone lube to it, which rapidly disappeared – I assume it was absorbed into the rubber. Although this was made in Portugal I noted some plastic parts with German labellings. 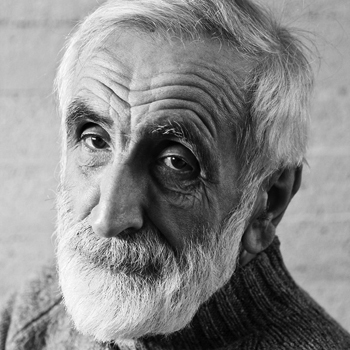 Other information about this model deems it a Messa, which I understand had some connection to Germany. 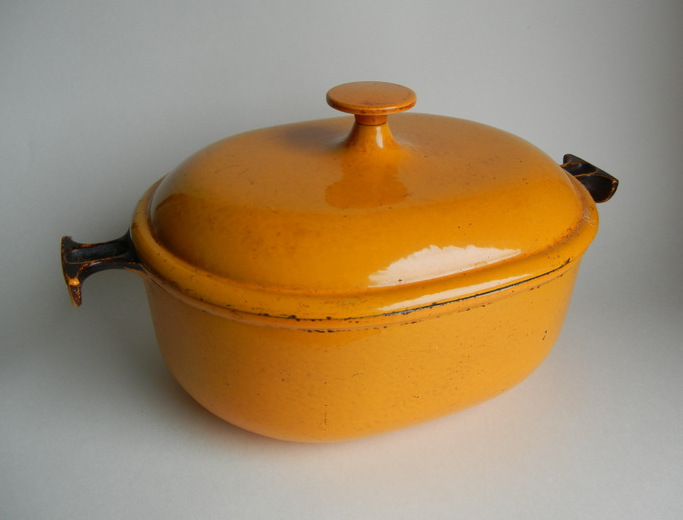 Was this a German design? 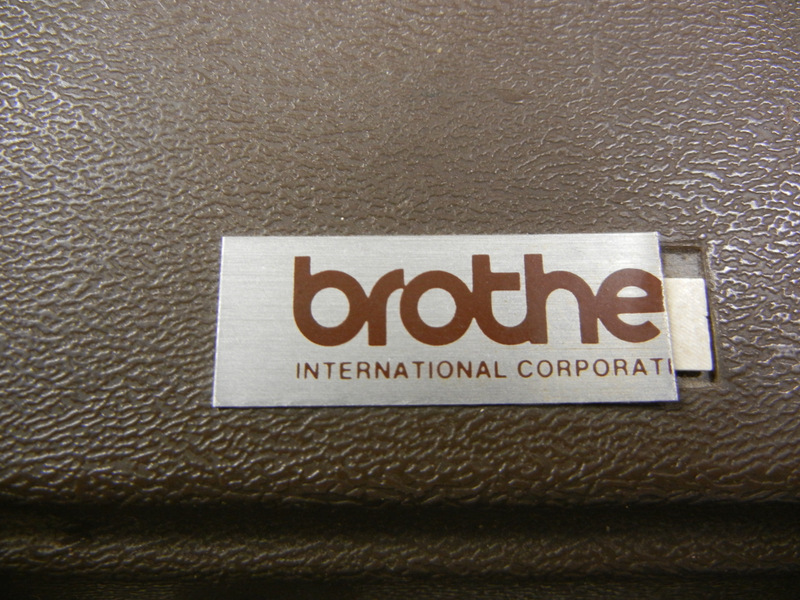 It is puzzling that Brother, a tremendously successful manufacturer of ultra portables, would put their brand on a foreign product, and one they didn’t even design! Topsy turvy. 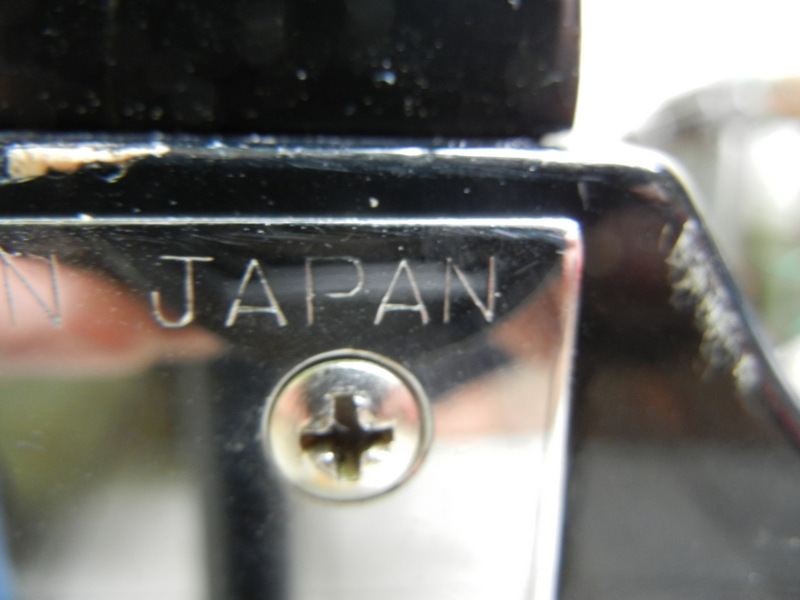 Last weekend I found this old Japanese electric guitar in the back corner of a thrift shop. 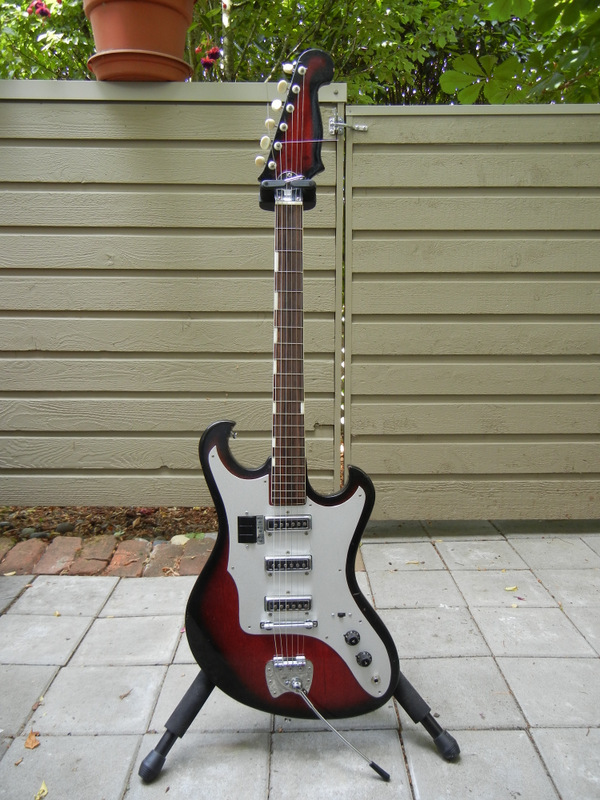 It had no strings, one tuner gear and post was missing, and it looked rough – but I took a chance and bought it. I figured the cost would provide me the enjoyment/education of either fixing it or discovering it was irreparable. At the worst it was worth it just for the possibility of the spare parts! When I got it home I plugged it in. Static. I proceeded to disassemble it. The entire face plate comes off with all the electrics mounted to it. The jack was loose and the cable flopped around in the throat, causing intermittent signal. After replacing the cable plug with a new one, and cleaning up the switches it responded with a signal. All three pickups tested for continuity, so that seemed in order. Down to the guitar shop for strings next. With strings on the action was way too high, even with the bridge bottomed out. Neck off, the retaining screws had lost their bite in the wood. 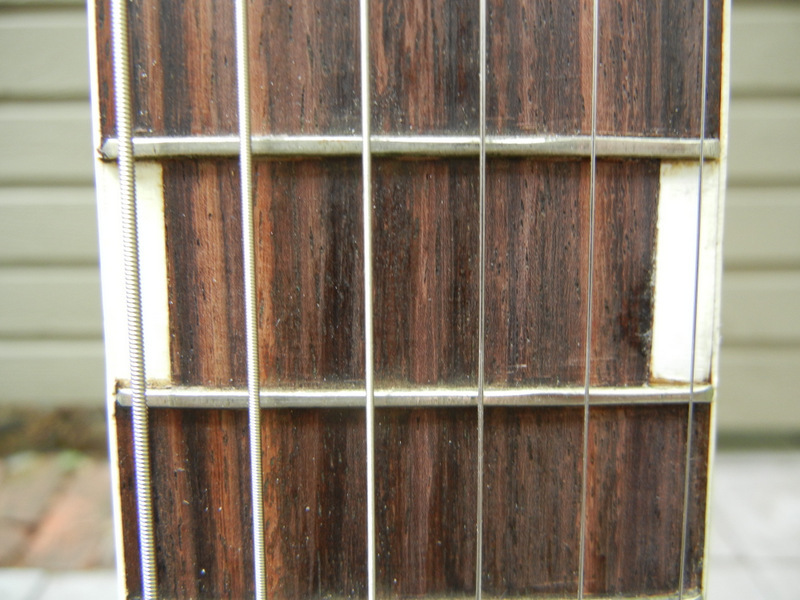 Holes filled and re-drilled, a 0.76mm plastic shim was inserted to tilt the neck just slightly backwards, dropping the string height. Action OK, next I discovered the nut was all wrong, with string spacing uneven and again too high. Fortunately the nut had so much extra meat on it I was able to file the grooves out and re-cut it. The tremolo needed work, of course. Under the plate is a coil spring, like a car suspension. Things were bent and rubbing but with a bit of filing and bending it too came together. The wheels to adjust the bridge height were gone, but I salvaged a pair from my parts box. Luckily they had the same thread. The bridge had no compensating angle however, but the face plate holes were oblong, which allowed me to move the treble end a bit closer to shorten the high strings. More work included scraping crud from the fingerboard with a razor blade, gluing various loose plastic neck trim bits, and scrubbing up the aluminum face plate. I fixed the missing tuner post with a salvaged post and gear, which was not perfect but seemed to work well enough. After one more check-over all was ready for the big test. Amplified it sounds surprisingly good! 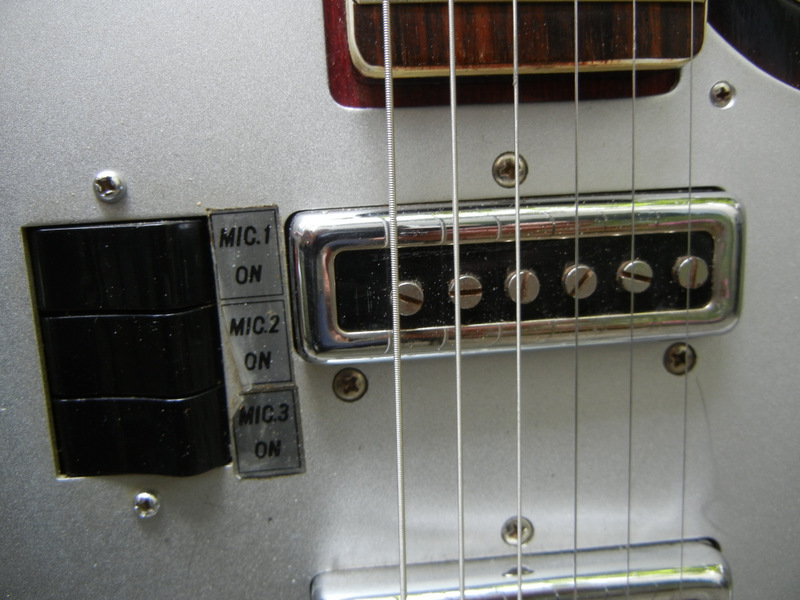 Despite the fact that the pickups are single coils they are very quiet. With three pickups and one master tone control the sound possibilities have a great deal of range, from high and clear to deep and crunchy. The scale length is 680mm (26.77″), which means the neck is very long indeed and while it’s not hard to play chords, it is quite a stretch out to first position! The neck is a honker however, almost like a bass. 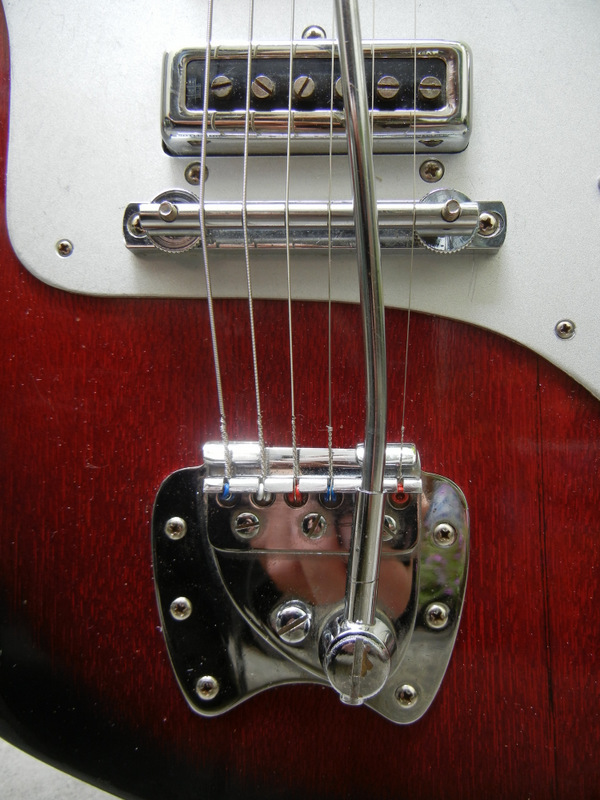 The whammy bar is effective – it gives just a little trem and returns back to tune. For more on this, plus a cool video, check out the four pickup version here: Adventures in Baritone – 1965 Kingston FVN4 Japanese Electric Guitar | Drowning in Guitars! 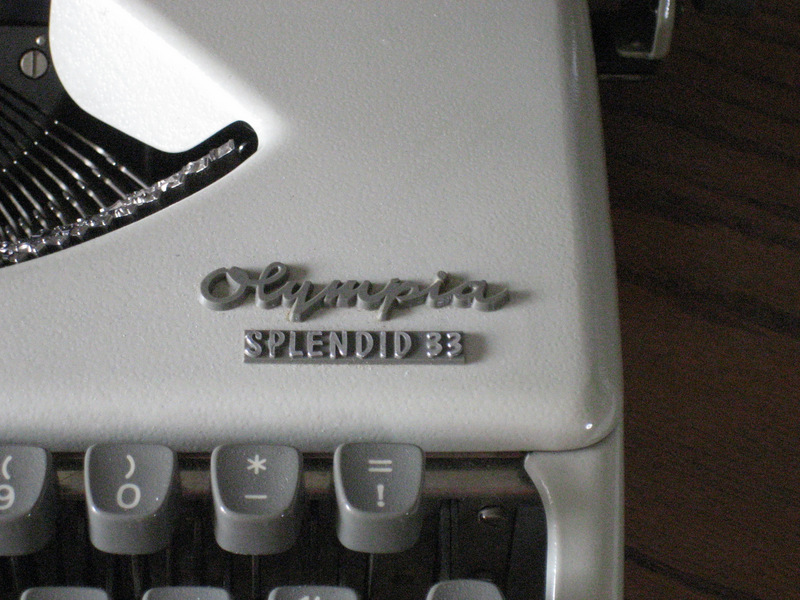 Recent treks to the thrift shop turned up a lovely Olympia Splendid 33. Aside from vacuuming out all the dust and bits of rubber erasings it required a minor repair: the carriage was off the lifting arms. This was easily fixed with the aid of a small wrench and a jeweller’s screwdriver. I also treated the platen with a very light coating of silicone lubricant, rubbed on with a rag. 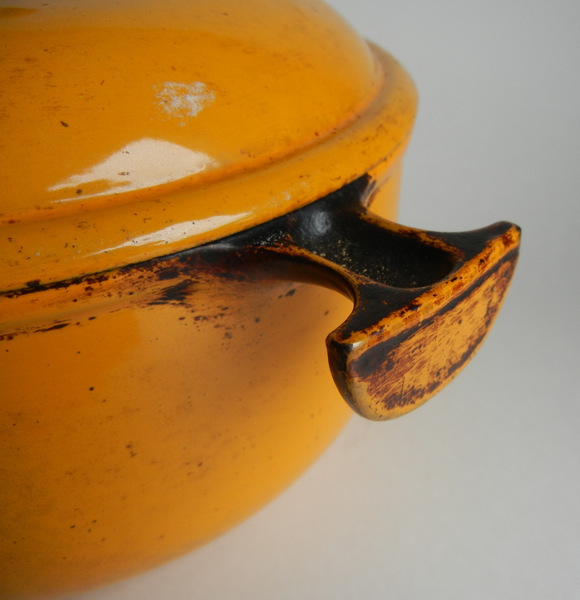 Silicone seems to do wonders for platens, but should be used sparingly. This platen now has a perfect grip. 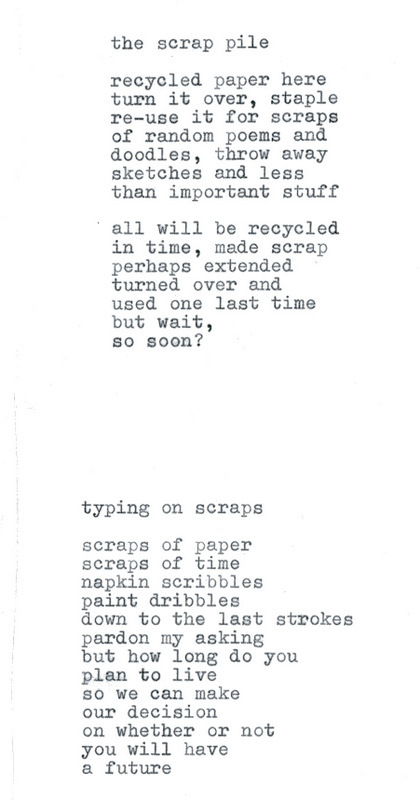 It took a few days for the treatment to dry properly however, as at first the rubber was a bit too soft and impressionable – like a lot of people..
I’ve left this machine on my desktop, the real one that is, where from time to time I like to doodle away with random musings – here’s a couple. 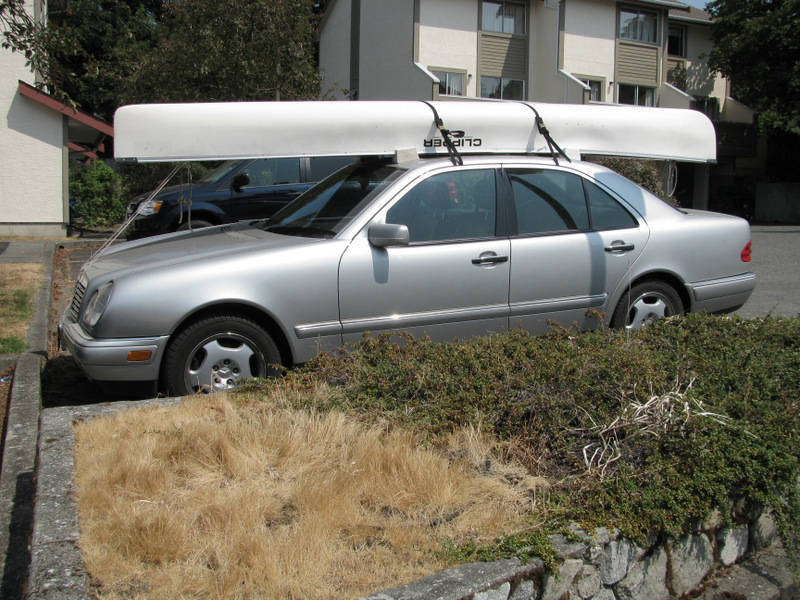 It’s summer and the canoe has been placed on the roof of the car for convenience. 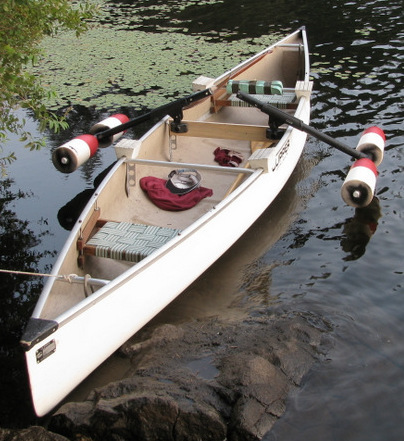 My canoe (we all have one here in Canada) is narrow, fast and very wobbly. It was made for solo paddling, but I converted it to a two seater. 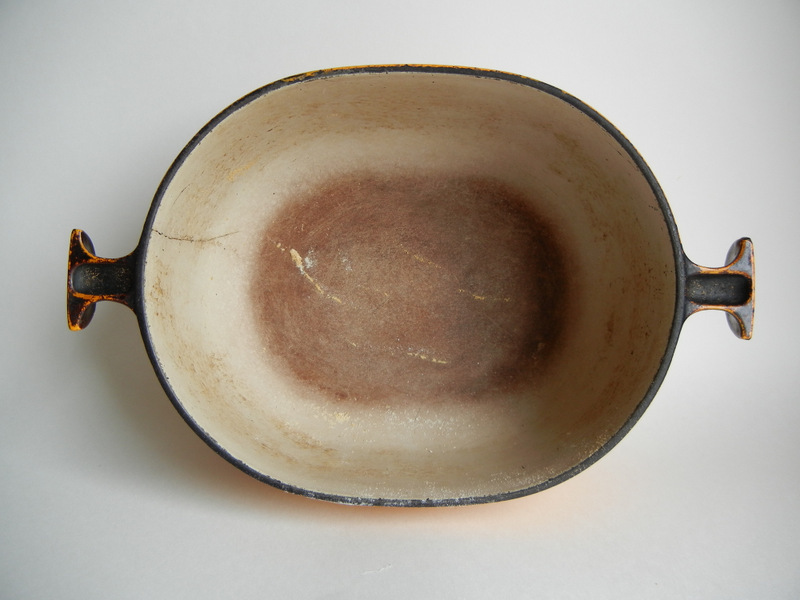 At 30″ wide it’s about 6″ narrower than most canoes and it can feel quite unstable. So I did some research on homemade outriggers and the other day I ran all over town and got what I needed. It wasn’t that difficult and it has made a major improvement in the boat. We tested it last night and found the canoe to be much more stable, but with no discernible drag. The pontoons are set just above the waterline, and they dip in on one side then the other as the boat rocks, enough to create stability without ill effect. I made a manual in case anyone here wants to make their own. Have fun and let me know how it works for you. Please note: this has not been certified, rigorously tested or engineered for safety. Use at your own risk, and be careful!